Agnetha Sjögren is a Swedish artist who has been based in London for over 15 years. Her playful and sculptural practice has led her to create exquisitely hand crafted one-off art dog sculptures and limited edition prints. 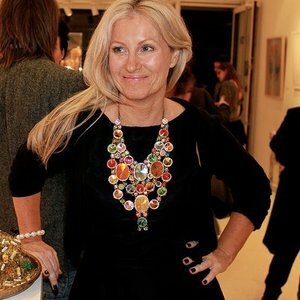 Her work has received extensive press coverage in editorial publications such as Vogue, Elle and Design Week as well as being shortlisted for the Summer Show at The Royal Academy of Arts, invited to OCCCA in L.A, exhibited on London Underground and has taken it's proud place at the heart of the British and Swedish art scene. Agnetha's background as a designer, makes quality and sustainability the focus of her creative thinking. Born and educated in Sweden, Sjögren is a multi-disciplinary artist who brings art and design together whilst drawing inspiration from the relationship between urban life and nature. Sjögren's work has been bought into private collections and luxury brands all over the world, notably the USA, Canada, UK, Switzerland, South Korea, Sweden and Japan. They have been invited to fashion shows in New York and Moscow as well as having been exhibited at the high-end fashion store Lane Crawford in Hong Kong and selected to The Aesthetica Wish List 2011 amongst Stella McCartney, Louis Vuitton and Elin Hoyland. "The art-dogs started because I got tired of all people telling me that their dog was nice! I am afraid of dogs and I wanted to show people what a "˜nice' dog is. My dogs don't eat bark, jump, bite, drool or need to go out for a poop. They sit or stand "˜nicely' all day long, you can come and go as you please without having to worry about them... Now that is a "˜nice' dog! " These one-off handmade sculptures are authenticated with their own personalised name tag, collar and unique story detailed within a signed mini passport. Limited edition prints of 25 are also available of some of the dog sculptures. Bespoke edition sculptures can be made to order upon discussion of your requirements.